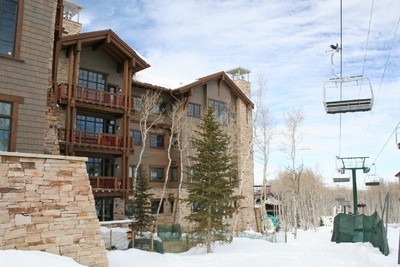 Arrowleaf condos are ski in ski out Deer Valley condos located along the Silver Buck ski run at Deer Valley® Resort. Arrowleaf enjoys a preferred location in the Village at Empire Pass, right across the ski run from the Tower Club. Quickly & easily gather all the info you need about Arrowleaf. Our FREE Park City & Deer Valley Real Estate Concierge is at your service! Call toll free 1-800-485-0218 or use our Live Chat for instant answers to your resort real estate questions. Arrowleaf is known for its classic mountain lodge style interiors, with rough cut hardwood floors, richly colored wood doors and trim. Arrowleaf includes two different buildings--Arrowleaf A and Arrowleaf B lodges. Both lodges share the same common area amenities, including a hearth room, ski locker room, outdoor hot tubs, and a small library area where you can grab coffee or hot chocolate on your way to or from the slopes of Deer Valley® Resort.